It’s not often that the egg whites are the leftovers, but after a carbonara dinner I was left with two lonely whites in a mug begging to be used. I’m a pavlova veteran but 2 egg whites wouldn’t make much of a pavlova so I thought of their close family member the meringue, which I had never made before. I did a bit of research and settled on Delia Smith’s recipe, on the basis that it had the least ingredients and very clear instructions. If you haven’t made them before I recommend checking out Delia’s guide. All the recipes remind you to ensure that your utensils are spotless. Preheat the oven to 150C and line a baking sheet with baking parchment. (The recipes tell me that meringues stick to greaseproof paper so it’s important to using baking parchment or baking paper) . Whisk the eggs slowly to begin with in an electric mixer. When the are starting to look combined (after a couple of minutes) turn up the speed of the mixer to medium and continue to whisk until as the books say the mixture forms “stiff peaks”. If you don’t know what stiff peaks look like think shaving foam or bubble bath, nothing less foamy will do. Then turn the mixer speed up to fast and add the sugar, around one tablespoon at a time until it’s all in. This will turn the mixturethick and glossy. Next, spoon the mixture onto the baking tray in dollops. (If you feel fancy you can pipe them with an icing bag). Turn the oven temperature down to 140C and cook for 30 minutes. 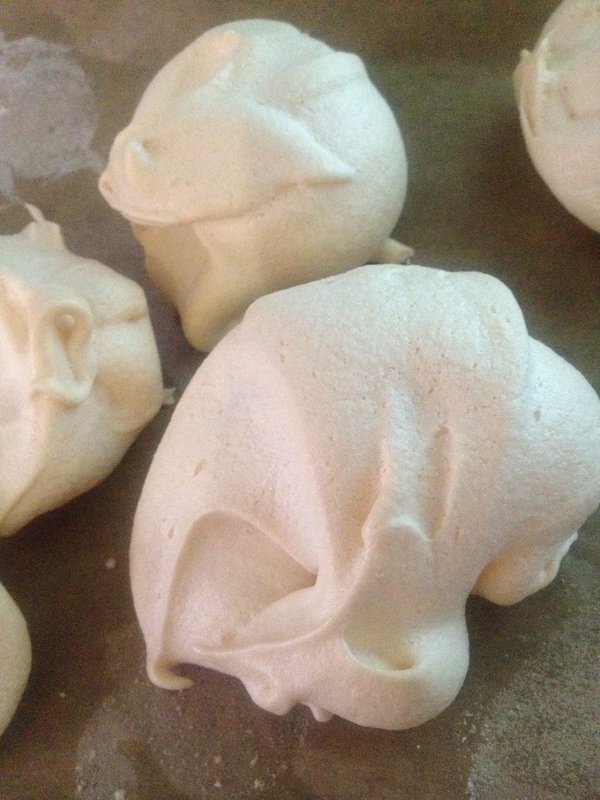 After the 30 minutes, turn off the oven BUT leave the meringues into the oven until the oven is cold. I like meringues plain or with fresh fruit and a little cream, but there are so many options, you could use mascarpone, creme fraiche, yogurt, icecream, toffee sauce, chocolate sauce. They are just delicious, crunchy on the outside and gooey in the middle. Two delighted small boys brought them in their lunchboxes and I scoffed the rest. I will start using my camera for blog photos soon! Baking, dairy free, Delia Smith, desserts, Egg white, lunchbox, Meringue, recipes, treat. Bookmark.